Abstract World War 1 letter which accompanied the memorial plaque for William Thomas Dundon, killed at Gallipoli. Addressed to Mr. P. Dundon, 49 Bignell Street, Gonville, Wanganui. 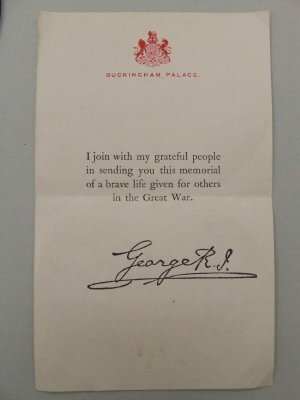 Letter on cream paper has a red crest and below that, "Buckingham Palace. I join with my grateful people in sending you this memorial of a brave life given for others in the Great War. Signed George Rex."